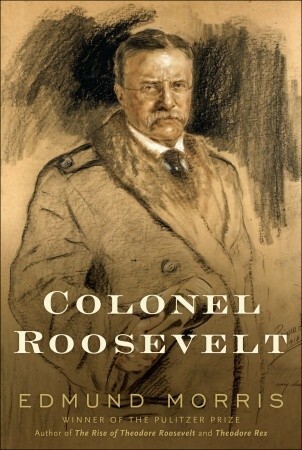 “Colonel Roosevelt” is the final volume in Edmund Morris’s trilogy covering the life of Theodore Roosevelt. Published in 2010, this widely anticipated volume concluded a three-decade long effort to chronicle the life of this colorful and complex man. Morris is currently working on a biography of Thomas Edison. The volume opens with Roosevelt embarking on an African safari just weeks after leaving the White House. Morris regales his audience with tales of adventure before returning Roosevelt to America on a wave of great popularity. Disappointed with Taft’s leadership, Roosevelt soon establishes himself as a candidate for the presidency. After his electoral loss to Woodrow Wilson (having split the Republican vote with Taft) Roosevelt embarks on a tour of the Southwest US followed by a more harrowing journey through the South American jungle. Morris vividly and energetically describes these journeys which, particularly in the case of his Amazonian trek, are quite captivating. Only world war, the death of his youngest son and his final sad decline remain for Morris to document. Similar to its companion volumes, “Colonel Roosevelt” is erudite and well-researched with over 150 pages of bibliography and endnotes accompanying 570 pages of text. Morris’s writing style in this volume is reminiscent of its smooth and refined predecessor rather than the first volume of the series, with its far more serpentine sentence structure. Fans of Teddy Roosevelt will find much to like in this volume; it contains most of the drama of the first volume along with much of the political tension and intrigue of the second. But where the series opener was full of unbridled youth and the second filled with more sober political maturity, this volume is really a well-written slow-motion tragedy – a tale of the seemingly inevitable fall of a once-great figure. Roosevelt’s final descent is almost as unsurprising as it is painful, and Morris covers it adroitly. In contrast to previous volumes, Roosevelt’s family receives its fair share of attention. This is fortunate, for they add significant color and texture to the narrative. And where important political figures (friend and foe alike) received less focus than deserved in earlier volumes, Morris more carefully documents those relationships as well. However, Morris cannot help but see political rivals such as William Howard Taft and Woodrow Wilson through TR’s partisan lenses. As a result they come across as shallow, two-dimensional and generally incompetent political figures. Readers seeking more balanced portrayals of Taft or Wilson would do well to search for it in biographies where they – and not Roosevelt – occupy center stage. This biography finishes on a high note, with the final chapter devoted to TR’s legacy, his surviving family and a review of his treatment by other biographers. Unfortunately, Morris does not really explore whether the traits that led to the rise of this complex, effervescent and recondite personality also led to his downfall. And where some biographers dissect and reassemble a fully-explored subject, Morris’s emphasis is clearly on description rather than interpretation. But overall, “Colonel Roosevelt” completes Edmund Morris’s trilogy in meritorious and satisfying fashion. It possesses much of the energizing raw material of the series’ first volume and is written with the literary flair and fluidity of the second volume. This final volume in Morris’s series provides a fascinating, if at times heartbreaking, review of the post-presidency of one of our nation’s most compelling chief executives. Just finished this one after being left underwhelmed by Power & Responsibility. This one really kept me interested the whole way through and with every chapter finished i would get sad that it brought the ending closer. I will eventually get to volumes I & II after I get through Millards TR and Garfield works. I never claimed to be a genius but Morris really had me googling words and phrases quite a bit and rereading paragraphs a couple times to comprehend them. Even so it was well worth it.